In the Arctic Ocean, the area covered by sea ice grows and shrinks over the course of the year. Each fall, as less sunlight reaches the Arctic and air temperatures begin to drop, additional sea ice forms. The total area covered by ice increases through the winter, usually reaching its maximum extent in early March. Once spring arrives with more sunlight and higher temperatures, the ice begins to melt back, shrinking to its minimum extent each September. As of 2018, the downward trend for the summer minimum in September was 12.8 percent per decade relative to the 1981–2010 average. Summer ice declines have been especially rapid since 2001. Explore this interactive graph: Click and drag to display different parts of the graph. To squeeze or stretch the graph in either direction, hold your Shift key down, then click and drag. This graph shows the average area covered by sea ice during September each year. Minimum sea ice extent has decreased 12% per decade since 1979. Data provided by the National Snow and Ice Data Center. Just as ponds and lakes in northern states develop a layer of ice on their surfaces during cold winters, the surface of the Arctic Ocean also freezes, forming sea ice. Seawater has a lower freezing point than fresh water, but once it is chilled to around -2°C (about 28°F), the salty liquid begins to solidify. Ice crystals appear on the sea's surface, and if the air is cold enough, the crystals expand to form a slushy mix, then a solid covering of ice that can thicken over time. Early observations of sea ice coverage in the Arctic come to us both from the oral histories of native populations and from the records of early European mariners who were seeking a "Northwest Passage" to the lucrative markets in Asia. For as long as humans have been keeping track, large areas of the Arctic Ocean have remained covered by sea ice throughout the year. However, over the past 40 years, the area covered by ice has shown a dramatic decrease. Since satellite-based measurements began in the late 1970s, data show a trend of more ice melting away during summers and less new ice forming during winters. 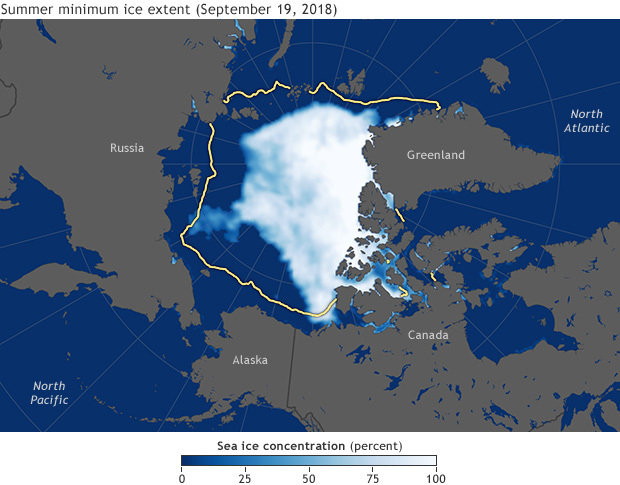 On September 19, 2018, and again on September 23, 2018, the sea ice cover reached its annual summer minimum: the area covered by at least 15 percent sea ice was 4.59 million square kilometers (1.77 million square miles). This was the sixth smallest extent of the satellite record, statistically tied with the minimum extents for 2008 and 2010. This image shows Arctic sea ice concentration on September 19, 2018, one of the two dates that sea ice experienced its minimum extent in 2018. Higher concentration appears white, and lower concentration appears blue. Extent is the area covered by at least 15% sea ice, and the yellow line indicates the 1981–2010 median extent for this date. Image adapted from NASA Earth Observatory using data from the National Snow and Ice Data Center. In the early twentieth century, explorer Roald Amundsen took three years (1903–1906) to traverse the Northwest Passage. Since the turn of the twenty-first century, that passage has experienced relatively ice-free conditions multiple times, though it's not yet a dependable pathway for commercial ships. The Northern Sea Route along the coast of Siberia has begun experiencing summertime sea ice declines that may transform it into a reliable shipping route. The opening of shipping lanes across the Arctic may provide shippers with viable alternatives to traveling through the Panama Canal or around the southern tip of South America. This new reality will have impacts not only on the environment, but also on the world economy and national security, as nations compete to gain rights to shipping lanes and newly accessible resources in the Arctic. Climate scientists are particularly concerned about the decrease of sea ice because its white surface reflects up to 80 percent of incoming sunlight, deflecting additional energy away from the planet. With less ice present, the dark surface of ocean water absorbs considerably more sunlight energy, leading to further warming of the atmosphere and more melting of ice, which leads to further warming... Scientists are actively studying the effects of this positive feedback loop to help them understand and predict how the observed decrease in Arctic sea ice will affect the global climate system. Arctic Meltdown, Economic and Security Implications of Global Warming. Foreign Affairs, Scott G. Borgerson. Accessed March 17, 2009. All About Sea Ice, National Snow and Ice Data Center. Accessed March 17, 2009. State of the Cryosphere: Sea Ice, National Snow and Ice Data Center. Accessed January 11, 2017. Arctic Sea Ice News and Analysis, National Snow and Ice Data Center. Accessed March 16, 2019. Intergovernmental Panel on Climate Change. (2013). Climate Change 2013: The Physical Science Basis Summary for Policymakers. Contribution of Working Group I to the Fifth Assessment Report of the Intergovernmental Panel on Climate Change. September Sea Ice Extent, National Snow and Ice Data Center. Since satellite-based measurements began in the late 1970s, Arctic sea ice extent has decreased in all months and virtually all regions, with the exception of the Bering Sea during winter. On September 19 and 23, 2018, the sea ice cover reached its annual summer minimum: the area covered by at least 15 percent sea ice was 4.59 million square kilometers (1.77 million square miles). This was the sixth smallest extent of the satellite record. As of 2018, the downward trend for the summer minimum in September was 12.8 percent per decade relative to the 1981–2010 average. Summer ice declines have been especially rapid since 2001. The ice that survives year-round is thinner and more fragile than it used to be.